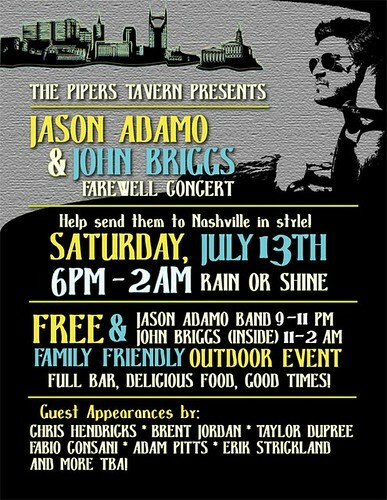 Jason Adamo and John Briggs, two very talented local musicians, will be performing their last show in Raleigh at Piper’s Tavern Saturday July 13th 6pm-2am before they move to Nashville. Piper’s is holding this FREE CONCERT on an outdoor stage behind the Tavern featuring local musicians leading up to Jason and John headlining. The outdoor concert is from 6pm-11pm and is a Kid Friendly event so bring out the whole family! Music starts at 6pm! Jason Adamo Band at 9pm! John Briggs plays inside Pipers 11pm-2am! Many of Jason’s musician friends will be stopping by to perform acoustic sets before the band plays, and during Brigg’s inside set.